We’re programmed to see patterns and trends in all aspects of our life, so why shouldn’t this translate to how we market to our customers? Throughout my years working in digital marketing, I’ve learned that consistency really is key, and with the blow up of Wendy’s Twitter, we can see why. Scrolling through Twitter, we can easily see that Wendy’s, the fast-food chain, is quickly making their mark! Wendy’s has truly found their voice and it’s resonating with their users. While we don’t recommend you going out of your way to “roast” your competitors or consumers, there is a lot we can learn from Wendy’s in helping us find our voice. First, let me take you through the journey of Wendy’s if you haven’t had a chance to follow it. Wendy’s has always had some sass behind their Tweets, but recently they learned to embrace it and show their rebellious tone. As the fast food chain got challenged by a user about their “fresh, never frozen” meat in early January, the chain responded back with a courteous tweet explaining they’ve used fresh beef since 1969. 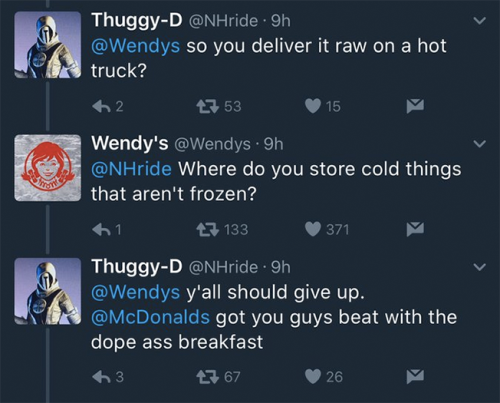 As “Thuggy D” continued to heckle, Wendy’s sass started to show its face in the following tweets. While we all enjoy putting our Trolls in their place, this can be a tricky situation for many brands. As one tweet or two can land you in some hot water. Continuing with Wendy’s Twitter feed, the chain grew it’s following in less than a month by 35% (350K followers). I know, it’s tempting to start firing shots on Twitter now to raise that follower count, but I’ll get to the reason why you should hold off on that a little bit later. Since the beginning of January, the chain has received a massive number of mentions from users asking to be “roasted” or “heckled”, along with Wendy’s doing their own social listening. From their efforts, they’ve found a way to engage with users, keeping them entertained by creating small beefs with other brands (Hardees) and users alike …Yes, pun intended. Now, what can your brand learn from this and use in your own marketing strategy? Take stock of who’s listening, age plays a factor in Wendy’s strategy. As we know, certain types of messaging will resonate better with some generations more than others. Roasting people online seems to work better with Millennials and younger generations. What are their interests? What else do your followers have in common besides your brand? Find these interests by listening to your customer base through engagement or other forms of social listening. Are you including a human factor into your messaging? A huge complaint of many users has been that brands are too “corporate” in their social media. As you can tell, being “real” in your responses can have a positive impact on your followers. When someone reaches out, they want to be greeted by a human, rather than an automated response that is only available to answer certain inquiries. Aligning with the brand’s goals or values. When sharing any content, be sure that it supports your brand’s goals, these could be thought leadership, brand awareness, increasing awareness of a new product/service, etc. Know where your brand stands (Fresh, never frozen) and highlight those values through your messaging. People love knowing that they can trust your brand, that’s why they buy your products or use your services right? Trust is built through consistently providing a high level of quality. Why shouldn’t your social voice be held to the same standard? Users value knowing that they can count on your messaging to provide them with what they’ve come to expect rather than it being a gamble every time. Give users something new and unexpected, every now and then it’s important to keep users on their toes. For example, Grey Poupon, already branding themselves for being rather “classy”, decided to launch a campaign in 2012 that would only accept users that met their qualifications, or “cut the mustard” if you will, to like their Facebook page. While it stays consistent with their messaging of consumers being of a certain class, it is outlandish to have to qualify in order to follow a page, which is exactly what got people talking about them! Now that you have an idea on how to claim your brand’s voice, get out there! If you need any help in developing your voice or running campaigns that express who you are, please feel free to reach out to us at Anvil Media.